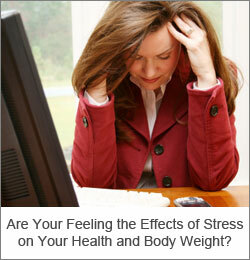 Are You Experiencing these Debilitating Effects of Stress on Health and Your Body Weight? Let’s take a look at the dire effects of stress on health and at how chronic stress contributes to unending difficulties in losing weight. In a few moments you’ll discover some practical ideas for releasing anxiety and stress management tips that you can apply immediately to release bottled up stress and stop accumulating body fat – especially abdominal fat. Whether you like it or not, stress is everywhere. It affects your body and mind more than you’ve ever imagined. These days, simply being alive and functioning is a sure recipe for high stress levels. That’s why anxiety and stress management techniques are in such great demand – because, unfortunately, stress has become a way of life for most of us. And because we have to put up with these stressors on a daily basis, the harmful effects of stress on our health create a host of symptoms – including increased abdominal fat. Yes, prolonged stress affect health and – ultimately – your body weight. If you are like most people, you too get stressed out every single day over deadlines, traffic jams, annoying noise, frustrating bosses, irritating colleagues, hassles big and small, and any number of regular stressors that are guaranteed to set your blood pressure soaring and your ears ringing, right? You’ve probably heard that physiological effects of stress on health, especially from long term and high stress levels, are downright disastrous… Well, it’s true; your mind and your body end up paying a huge toll for the high-powered lifestyle. The effects of stress on your body leave you feeling overwhelmed and completely sapped. But how does stress affect health, exactly? Well, stress is simply your body’s instinctive, automatic response to any kind of (perceived) threat, attack or harm. Overly simplified, your nervous system is hard-wired to cope with any kind of threat by releasing instantly fight-or-flight response stress hormones like adrenaline and cortisol in your blood stream, to get your body “ready” for whatever emergency action might be necessary to protect you from the perceived harm. It’s true, small doses of stress effects body positively, helping you focus and perform better, even acting as a motivational force. On short term, physiological effects of stress include increased heart rate and blood pressure, accelerated breathing, dilatation of pupils, sharpening of the sight; blood is forced away from the digestive tract towards the limbs, muscles tighten up, perception of pain diminishes, and so on. Although this short term response to threatening events are meant to increase your strength, stamina and reflexes in case you have to fight a bear or escape from it, long term, constant elevated stress levels cause a lot of harm to your system. You have to “control yourself” and “deal with it”. But your body’s hormonal fight-or-flight dynamic is already triggered; cortisol, the stress hormone is at its peak. As you might remember from our discussion on stress and weight loss resistance, when cortisol levels are high you eat more, burn fewer calories, and store more fat. The bad news is that continuous bottled up stress leads to to eating disorders as well, another major reason you’re unable to lose weight. …can’t be ignored. Your metabolism, brain, heart and immune system are all dramatically affected by the physiological effects of stress. Metabolism: high cortisol levels switch your body from a normal fat-burning to a fat-storing mode; the chances of experiencing symptoms like thyroid dysfunction, low metabolic rate, diabetes, syndrome X, are increased manifold with high levels of long-term stress. Brain: long term stress affects brain functioning through the continuous release of cortisol – a condition known as adrenal fatigue. High cortisol levels impair neuron activity causing irreversible damage: short-term memory, clarity of mind, judgment, learning ability are all dramatically affected. Cardiovascular System: Increased adrenalin causes a spike in the heart rate and blood pressure increasing the risk of cardiovascular disease and stroke. Immune System: the effects of chronic stress on health include the suppression of the immune system, which opens the door to a great number of opportunistic infections. This is a bird’s eye view at the main symptomatic categories of the many effects of stress on health; if you’d like to see more and discover some practical solutions for immediate stress relief, here are 17 specific high cortisol symptoms.